When I was in high school several of my parents friends began building houses in the small Wisconsin town of Hazelhurst, just south of Minocqua — a popular vacation destination for people from Illinois. One friend of my parents, Neal, had a brother-in-law who lived in a small cabin on a tiny lake off County Road D in Hazelhurst. This lake had plenty of open lots that were for sale in the mid-1970’s and Neal, my parents and the Pasholks all decided to buy land and build vacation homes there. Their plan was to someday retire in these homes. The first to build there were the Pasholks, Marcia‘s parents. They bought a motor home or two and set them up on their property, built an outhouse and began building. Jack, Marcia’s dad, was a man-of-all-trades if there ever was one. He could build you a house, lay your carpet and build your furniture without consulting a book or expert. He also knew how to organize a group of people to help build that house. Some would say he was bossy. He’d say he was efficient. Either way, he got the job done with the help of his friends. Even Jeremy helped hammer drywall. While the friends helped build Jack’s house they stayed at Neal’s brother-in-law’s house, Jack’s motor homes or in tents. It was like a barn raising that I’d read about in history books. The women made breakfast, lunch and dinner for the men. The teenagers helped out how they could some of the time but mostly enjoyed the lake or the lure of Minocqua. This was Wisconsin, where the drinking age was 18. Three years younger than the drinking age in Illinois. Two women talking outside one of the houses being built. The next house to be built was Neal’s I think. I don’t remember being there for the building of it, but I remember camping out on my parent’s property. We borrowed a camper from a friend and a tent from someone else. We showered at Neal’s brother-in-law’s house or bathed in the lake (using the only biodegradable shampoo available at the time — Clarol herbal essence shampoo). My cousin Bob, who was living with us a the time, came along and helped build the house. He also met a local girl and had a week-long romance. Jeremy was also along this trip. When it came time to build my parent’s house, I’d broken up with Jeremy and met Dean. In between I dated a roofer who put the roof on my parent’s house. Dean came along to help work on my parent’s house one summer. We stayed in Neal’s house this time. Again all the friends helped with the building of my parent’s vacation home. Before Habitat for Humanity and that house building show on ABC right before Desperate Housewives, when I told people about the house raisings in Wisconsin, they were impressed that I got to witness such strong friendships as to help each other build their homes. They thought this only happened in the past. I feel lucky that I was part of it. I only hammered a couple of nails, but was there in other ways. When I visit the homes that my friends and family built, I feel a strong connection to them. I remember the land before it was disturbed, I remember seeing the huge holes in the ground, the foundations being laid, the skeletons of the houses, the walls being erected, the roofs being constructed. I’ve slept in all of these houses, eaten meals in each of the homes, played games, drank wine, and had deep conversations in them all. Some of the people I remember from these homes are gone from my life, some are gone from this world. But the memories remain. Growing up in a town where my parents, and some of their parents before them, had grown up, meant they had a huge group of friends and relatives in the area. These friends and relatives were the kind that stopped by without calling first. Many didn’t even knock or ring the doorbell and they always used the back door. The front door was for the other kind of company — the ones who did call first and for whom my mom would tidy the living room — and for salesmen and for the paperboy when he collected his weekly bill for the local paper. Weekends were full of comings and goings. People stopping by to say hello or to borrow power tools or dolleys or wheelbarrows. If they came before noon they were always offered a cup of coffee poured from the silver peculator sitting on the kitchen counter. They almost always said yes, then sat a while, usually smoking a cigarette while talking to my mom or dad. If they came after noon they were offered a beer or cocktail — there was always plenty of alcohol in the house, mostly for friends. Again, they usually said yes and sat, smoking and talking. I fully expected to have the same sort of Grand Central Station weekends when I grew up. It was natural and that’s how life was. Full of friends who knew what the inside of your house looked like before you had a chance to tidy up. Friends who knew what you looked like without makeup. Friends who borrowed things and loaned you things and helped you with large projects and who drank coffee or a beer at your kitchen table. Friends who didn’t call first. When Dean and I first moved to Pittsburgh we knew no one. We eventually made friends with people with whom he went to Carnegie Mellon and had some great times with them but it wasn’t the same. People didn’t come and go like at my parents’ house. We made PLANS. We set DATES. We CALLED each other before visiting. Maybe, I thought in Pittsburgh, you needed to have a house first — not an apartment. Maybe after Dean’s out of grad school things will be like they were when I was a kid, living at home. Maybe a house will encourage people to stop by, use the back door and not call first. Again, it took a while to get to know people in the DC area — longer than it took in Pittsburgh. We rented a house in Alexandria our first year and came the closest we’ve come to having the kinds of friends my folks had — at least I did. I became friends with the two elderly women on either side of our house and both of them would stop by without calling. Frances would use the back door (and encourage me to do the same at her house). Freda would use the front door. But neither called first. When we moved to another house in Alexandria we made friends with Totty, our next door neighbor. We’d usually meet in the back yard — since we spent a great deal of time on the huge back screened porch. We didn’t make plans too often and didn’t call either, but we did spend a lot of time together. So I suppose we had a spontaneous kind of relationship with Totty. But that was all. No one else came and went. We didn’t have anyone to offer coffee or beer to on a regular basis. Everyone else made PLANS with us and CALLED first. When we moved to Bethesda I didn’t even bother to expect having the open door kind of friendship with anyone. I had not gotten over my longing for it, but I’d given up hoping. It took me a long time to like Bethesda. It took me a long time to make any friends here. I’m still working on making friends, but no longer the kinds that drops in. I’m not sure they exist — or perhaps I’m not the kind of person someone would drop in on and I’m not sure I’d like it anymore. When I began working on a masters degree in 1998, I discovered instant messaging. I had long list of “buddies” and sometimes someone would pop in and say hi and we’d have a conversation. It was sort of like someone dropping in unannounced. I warmed to it immediately, but I don’t even do that anymore — maybe I’m getting old and don’t like interruptions in my solitude anymore. Still, when I read blog posts about places that actually have a sense of community I can’t help but feel a little envy and remember the days in my parents’ house when friends would stop by for coffee and a chat. We have a few traditions on the holidays — Christmas we go to Illinois and spend Christmas Eve with Dean’s family and Christmas Day with mine. Thanksgiving we often see a movie while the Turkey cooks. On Easter we go to church after a family Easter egg & Easter basket hunt. On Easter we also often take a photograph of the four of us all decked out in our Easter outfits. So, today we went to church and came home to take a photograph with my new camera. I’d seen the self-timer a couple of times, but never used it to take a timed photo except accidentally. Clare thought she knew what to do. Dean set up the camera on a tripod in front of the house and focused on the front stoop. Joe happily posed for him. Then Clare went out to help Dean set up the shot. She focused on him and took his photograph. Thinking it was all set, Dean called Andrew and me to join the family photo but no one knew what to do for sure. We tried a couple of times and stood on the stoop all wearing our best “say cheese” smiles but nothing happened. We felt a little foolish, especially when cars drove by. Clare suggested we take 4 photographs and Photoshop them together. So I thought I’dgive it a try. I did figure it out but was not fast enough to get in the photograph. And then couldn’t reproduce what I’d done the first time. The Three Ones and the back of Dona's head. So Andrew thought he’d give it a try. Finally Clare decides to try again. After pushing several buttons we noticed the light was flashing. She ran up to the stoop and got in the photograph just in time. We’ve since read the manual — so next year we’ll be all set. After writing the post about my great grandmother, Jessie Tyler, I talked to my mother on the phone. She had more information, that I probably knew already, but had forgotten it. 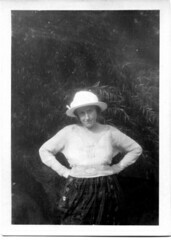 First of all, she identified a couple more photographs on the Old Photographs blog as being her grandmother. Upon careful inspection, I agree with her. She has my grandfather’s nose. Then my mom assured me that she didn’t dislike her grandmother, and told me that she and her brothers and sisters used to eagerly anticipate the arrival of their grandmother and her husband, Frank Harris each Sunday when they’d come to my grandparent’s house for dinner. She did admit that her mother wasn’t all that pleased that her in-laws came for dinner every Sunday — perhaps it just got old. Mom said that her grandmother would tell them all stories and that she loved that. Mom also mentioned the divorce — that Jessie divorced her first husband who was my grandfather’s father. Since that was highly unusual back then, I suppose it left a mark on Jessie. It is impossible for me to know, now, if Jessie was married to my great-grandfather when these photos were taken, or not married at all or perhaps married to Frank Harris. This all has a tragic ending though. Three tragic endings, actually. My great grandfather, (I think his name was Walter Green, just like my grandfather) Albert Green, was killed on the train track in South Elgin. I’m not sure if he was in a car at the time or if he was killed when walking across the track. I used to think he threw himself in front of the train, but it was an accident. Frank Harris, Jessie’s second husband, did kill himself though. He hanged himself. I don’t know if this was before or after Jesse died though. Jessie herself did not die an old woman in bed surrounded by her family. She was struck by a car in Elgin. It surprises me that I didn’t know any of this — or at least didn’t remember any of it or tie it all together. But looking carefully at the photo of Jessie with her son, she does not look like that defiant, teasing woman whose photo I adopted. She looks very sad. Edited 4.30.09 — Mom corrected me on two things 1) Jessie’s husband Frank committed suicide after Jessie was struck by an automobile and 2) the photo of my grandfather and the woman — the woman is not his mother. Mom doesn’t know who she is, but is sure she is not Jessie. Edited 4.15.17 — 1) Changed the spelling of Jessie’s name based on her signature in a book she owned and 2) added Albert Green’s name, crossed out speculation about his name being Walter Green. I love happy endings. I love connections. This is about both. When I was a child I found a book that belonged to my grandfather’s mother, Jessie Tyler. I knew it was hers because she’d written her name inside the book. She may even have written her age — I seem to recall that she was 12 when she wrote it. However, that may have simply been part of my fantasy, because, fantasize I did. I wondered what her life was like and what she looked like when she wrote her name in neat script on the inside of the book. I wondered how she liked the book — although I don’t remember the title (I thought it was The Secret Garden — but when I looked now, all I saw was some graffiti from pre-WWI Elgin High School students). I also looked in Ivanhoe, but neither of our copies of Ivanhoe have writing in them. I suspect that either the book is long gone or somewhere else in the house or the writing has faded so much that I cannot see it anymore. I even had imaginary conversations in my mind with young Jessie. When I first saw the name in the book, I asked my mother if she knew who Jessie Tyler was. She told me it was her grandmother — her dad’s mother. I asked my mom about her — hoping to learn that Jesse was a sweet and loving grandmother who doted on her grandchildren. My mom didn’t have a lot of good things to say about her grandmother, however. She mostly remembered her as being selfish or something. [Mom — if you read this, remind me what you said about Jessie Tyler.] She was married twice — the first ending in divorce, I believe. (For years I thought she was a widow but found mention of the divorce on the Internet). I knew the name Tyler though. I knew my ancestors were named Tyler and Tyler Creek in Elgin was named after our Tylers. Jessie’s father, Dr. Alexander Tyler, was a veterinarian and my grandfather had many of his grandfather’s instruments in his basement. My grandfather’s middle name was Tyler. Last year I began scanning some photographs that I took from my mother’s house and uploading them to another blog. Some of the people in the photographs I knew, but others I did not. One photograph that I especially liked was of a woman, arms akimbo, standing in front of greenery. I recently made that photo the background for my twitter profile as well as the gravatar icon for one of my email addresses. I even looked into registering “akimbo.org” or “akimbo.net” but they were both taken. If I had been successful, I would have used the photograph of this unknown woman as my “brand”. Something about this photograph called to me — the look on her face perhaps, or her posture maybe? Sort of teasing — kind of defiant? Whatever it was, I liked the photo enough to make it a part of me. Last night, just before I went to bed I checked my email once more and noticed that someone had commented on my Old Photographs blog. It was my mom. She’d finally gotten around to looking at the photos there and commented that one of the photos of ancestors I didn’t know was her father, my grandfather and that the photo of the woman in the white hat, arms akimbo, was my great grandmother, Jessie Tyler. The same woman whose book I owned. The same woman who spoke to me as a child. Looking back at this photograph and another taken the same day, there is no doubt in my mind that Jesse wanted connect with me. First through the name in the book and then through the photograph. Why not? We both loved her son — and I’ve dreamed of connecting with him again, after all. I’ve often written about the connections I’ve found on the Internet and this is just one more example. Edited 4.15.17: Changed the spelling of Jessie’s name based on the signature in the book mentioned here.